Sometimes, it feels as if fit is the Final Frontier; just beyond our reach; an ever-elusive goal; the missing link. You get the idea. No matter how many techniques we master, no matter how meticulous our sewing, for those of us who persist in making garments for ourselves, none of this does us any good if the fit isn’t right. Or if the garment doesn’t flatter our bodies. (The ones we have now, not the ones that persist in our heads!) Lots of books, workshops and instructors promise to give us the perfect fit, but I’ve never felt that any of them got me where I needed to be. Then I took some online classes from Sarah Veblen and found that what she wrote in her class materials made sense to me. Many emails, phone calls and hours of planning later, Sarah came to Chicago and gave a combination lecture/workshop that represents a turning point for all of us who participated. Sarah’s approach to fit is set out in her first book, The Complete Photo Guide to to Perfect Fitting, which stands out from all the other fitting books on the market. It’s not just that it’s comprehensive. It’s not just that it’s written in Sarah’s clear, thorough and understandable style. It’s not just that it has so many photographs that show you exactly what she is talking about. It’s that it introduces you to the concept of the fitting matrix, formed by the center front or center back and a horizontal balance line. From there, the muslin (and the body inside the muslin) can be divided visually into quadrants to achieve balance and proportion. 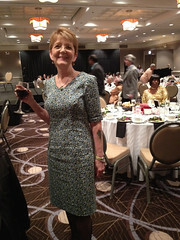 For example, a skirt hem can be brought parallel to the floor if a horizontal balance line drawn below the widest part of the body is brought parallel to the floor by adjusting the waist. Sarah is a truly gifted teacher. 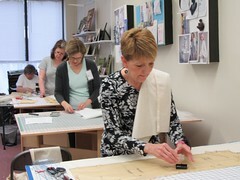 In her workshop, she taught us to “take charge of the pattern” to make it do what we need it to do. 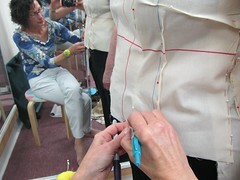 She taught us how to use a Fashion Ruler properly to get a smooth transition from altered seamlines to original seamlines. She gave us lessons in the basics of patternmaking that are needed to understand how to translate the contours of our bodies to a flat pattern. And, unlike many instructors, she taught us exactly how to transfer the pinned alterations on the muslin back to the paper pattern and walk the adjoining seamlines to make sure the revised pattern will go together as it should. The work was intense. For me, it took a lot of concentration and was frustrating at times. But it was well worth it. 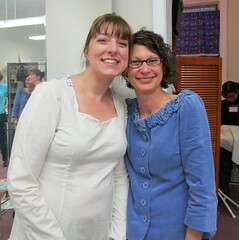 Like most of my fellow participants, I thought the muslin I prepared before the workshop fit pretty well. It did fit better than just about everything I’ve made in the past couple of years, but that’s not saying much. What I ended up with made me feel better in clothes than I’ve felt in years. 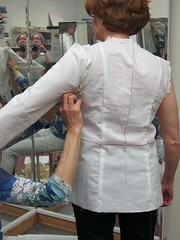 Some participants have already finished their first garments from their new and improved patterns. Others are still works in progress (but let’s not name names). As I work on my two-piece princess seam dress, the optimism is still there. That’s a feeling I haven’t had after any other fit workshop. Thank you, Sarah. 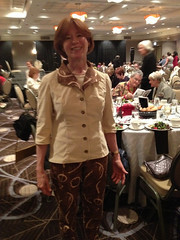 You may remember that we began an interview with sewing educator, author and custom clothier Sarah Veblen in September. 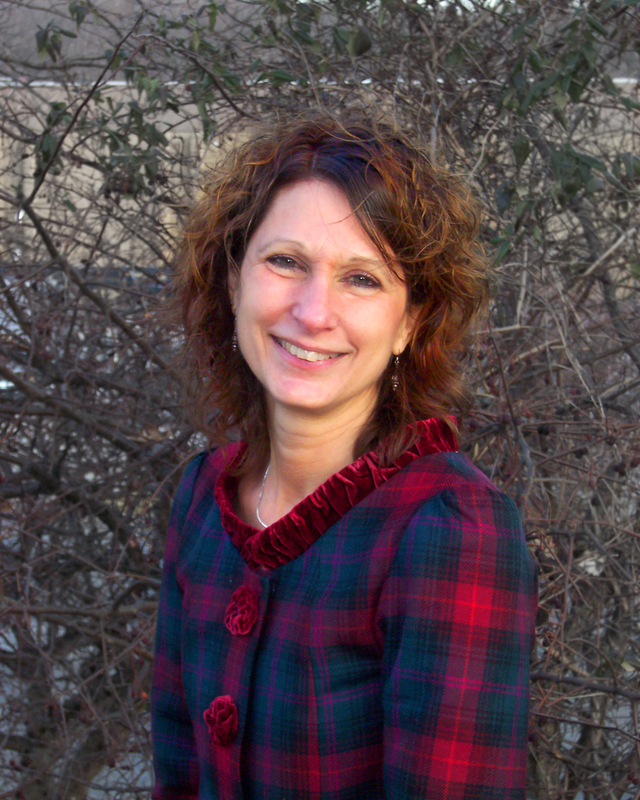 We’re looking forward to a Fit Workshop with Sarah at the end of April 2012. Details and a registration form will be published in next month’s issue of Cutting Edge, our Chapter newsletter. If you’d like to get to know Sarah a little better before meeting her in person, you can read the second part of her interview here. Enjoy!